The Captains of the Night logo. The 2009 Halloween events began at the start of October with the All Hallows' Spooktacular Promotion, and the introduction of new limited edition shipboard furniture items. These furniture items were available for purchase from furniture shoppes and stalls during the month of October, 2009, and included the skeletal helm, skeletal large cannon, skeletal medium cannon, skeletal small cannon, skelly cap'n figurehead, and skelly mermaid figurehead. On October 16th, 2009, masks became available from the palace shoppe. Pirates in all oceans were divided into five teams. The team names each made reference to a type vampire allusion. Prizes were references to vampiric items. Pirates participated by defeating as pirates from opposing teams in 1 v. 1 and team puzzle challenges. The standings for each team were regularly tallied and updated on a special "Competition!" tab of the notice board. Trophies were awarded to the participating members of each team who finished in each position. The pieces to the puzzle were scattered over all six of the English production oceans. One piece was found per ocean, inscribed on a tombstone somewhere on a specific island. Forum users immediately latched on to the curious fact that the word "Sat" on the fourth line was capitalized, realising that the puzzle contained a hidden message. 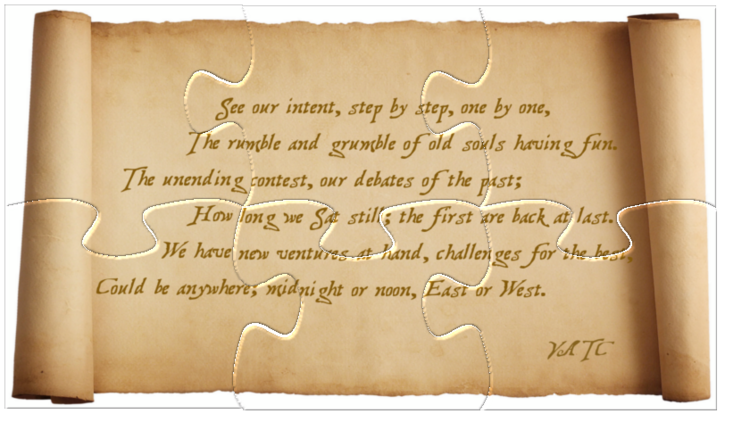 The clue to solving it was in the first line - "step my step, one by one". That is, reading the first word on the first line, the second word on the second line, and so on, up to the sixth worth on the sixth line, yields "See rumble contest, Sat at noon". Other users, continuing the pattern by reading up again in a V shape, also added the phrase "challenges are past fun" - it is unlikely this has any particular meaning, as the second and third lines are both one word too short to fit the pattern exactly. Who VATC is remains to be seen. Every ocean was given a Halloween Hang-Out! island on which pirates could congregate to enjoy the festivities. Skeleton tables were turned into game tables and tombstones gave a link to the Spyglass Vampirates page. There are also other seasonal decorations and portrait easels. Ocean Masters were also found on these islands. On October 23, 2009 pirates had the ability to become vampires. This can be achieved either by using the sanguine amulet (purchasable from the palace shoppe) or fighting someone who is infected and losing to them. The condition can be reversed either by using a garlic amulet (purchasable from the palace shoppe) or losing to someone not infected. The condition is reset when you log off. Limited edition clothing items were also available for purchase from the palace shoppe: vampire raiment (could be changed to any colors) and black vampire raiment, male and female versions available. This page was last modified on 17 June 2014, at 16:50.